I had been looking forward to another meal at Cuan Mor (Gàidhlig: “Big Ocean”) in Oban (An t-Òban, “The Little Bay”) even though the new menu there no longer includes vegetarian haggis in Oban whisky cream sauce that I had enjoyed so much the last time I was there. 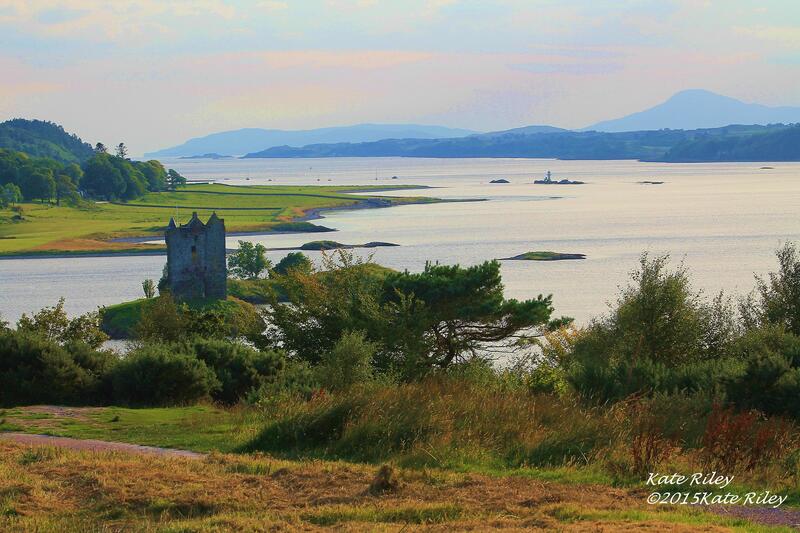 (I wrote about Oban here.) All the same, the food was incredibly good and the service was still very friendly. I asked for Glengoyne whisky with my dinner and the server brought me the 21-year and then made another trip to the bar to get the bottle so I could have a look at it. Yummy stuff, that! The rest of the evening was spent taking the tags off the clothes that we bought in Greenock that morning and re-arranging things in the carry-on bags that we had with us. The bed and breakfast was nice enough, but the breakfast was lacking in that everything was pre-packaged, microwavable food. After a half an hour or so on the phone trying to locate the luggage, we walked down to George Street to find some real food. Right around the corner from the Oban Distillery we found a sweet little café called Julie’s Coffee House. The food was good and the coffee was excellent; sitting there for a little while, looking out across the harbor, gave us time to re-start the day after the stressful time on the phone with British Airways. I gave them the address and phone number for the B&B near John O’Groats where we would be staying that night and again in two nights so that our bags could be delivered there. It was plenty of time, and I was assured that they were out for delivery. We headed off north on the A828 and since we were still feeling a little ungrounded from all the nonsense with the luggage, I pulled in to the car park at the Highland Titles Nature Reserve since we were driving right by. After a quick “good morning” to David who was surprised to see us again after our visit the day before, we took a few minutes to once again walk in the peace of the place. We left feeling refreshed and settled knowing that we would be reunited with our luggage that night. Marsha has a plot of land at the newer Highland Titles Reserve: Meadowview, or Bumble Bee Haven as it’s become known, so we turned west on to the A830 near Ft. William and went in search of any signs along the road that would let us know where it was. I had the general idea of its location, but without any signs, we weren’t able to find it. After a while, it began to not matter so much since we were thoroughly enjoying the drive as it wound alongside Loch Shiel. We drove as far as the Glenfinnan (Gleann Fhionghain, “white glen”) overlook. 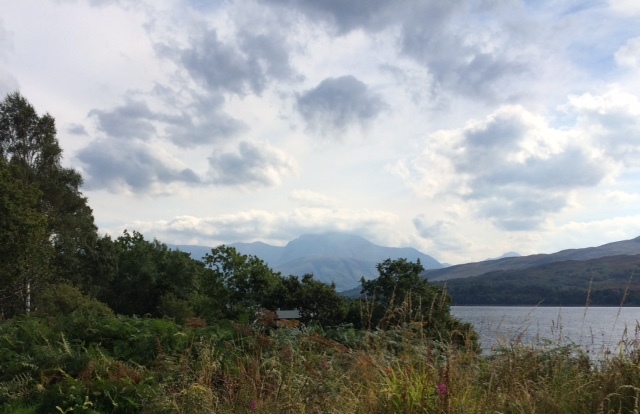 In 1745, Prince Charles Edward Stuart, “Bonnie Prince Charlie”, raised his standard on the shore of Loch Shiel (Loch Seile) and there began the Jacobite Uprising. The monument that now stands to commemorate the event was erected seventy years after the event. We then turned back to the east on the A830, ultimately heading northeast to John O’Groats, our destination for the evening. 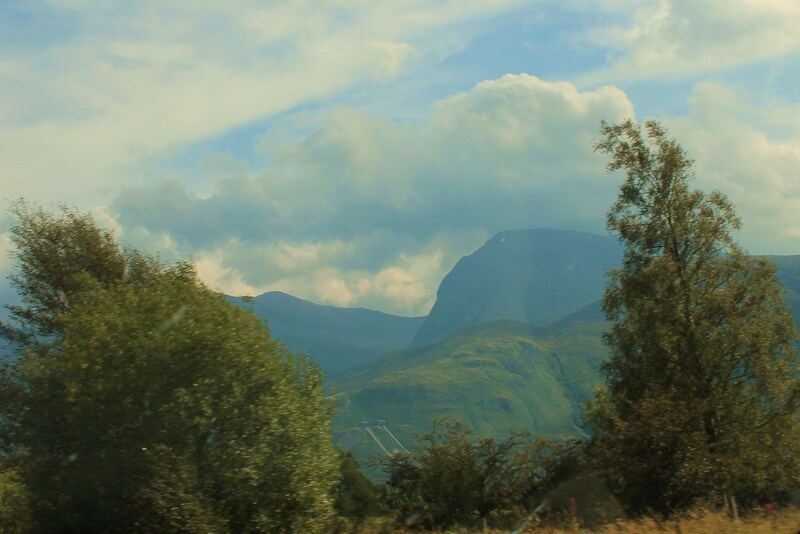 The main objective for the early part of the day was to capture as many photographs of Ben Nevis as we could. As part of a flute choir, Marsha has played Catherine McMichael’s Falconer many times. It is a flute quartet in which two of the four movements are named “Snow on Ben Nevis” and “On Seeing Castle Stalker”. We had achieved a few good shots of Castle Stalker on the previous day and now it was Ben Nevis’s turn to be in our spotlight. As we turned north on the A82 at Ft. William, the road began to look very familiar to me. Just as I was saying that I thought there was a neat little place to eat nearby, I recognized the turn off to the Nevis Range Ski Area. 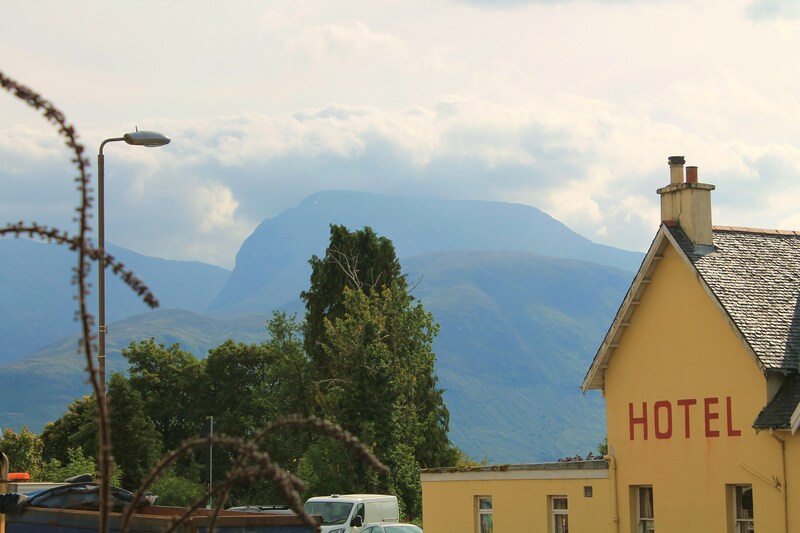 Nearly ten years ago, I had stumbled upon the Lochaber Farm Shop and Café when I had been doing just what I was doing on this trip: trying to find places from which I could get a good clear shot of Ben Nevis. I turned up the steep road, and at the top, and up an even steeper driveway, was the building that houses the Café and the little crafts gallery/store. It’s located in the same complex as the Lochaber Rural Education Trust, near Torlundy (Tòrr Lunndaidh,”eminence of the marsh”). After I got a few photos taken we went in to eat. The food was as good as I had remembered it to be; butternut squash soup and rocket salad for me and a brie and cranberry turkey sandwich for Marsha. The little shop turned out to be a treasure trove for us. I found a locally-made hand knit hat. I had packed three hats in my suitcase, promising myself that I wouldn’t succumb to my seemingly insatiable love of hats and buy another one on the trip. But, there I was, in need of a warm hat, so somewhat gleefully, I walked out of the shop owning a new one. I also found some wonderful goodies to have with us for snacks in the car. Thusly fed, rested, and warmed, we were off again heading for the North Country. 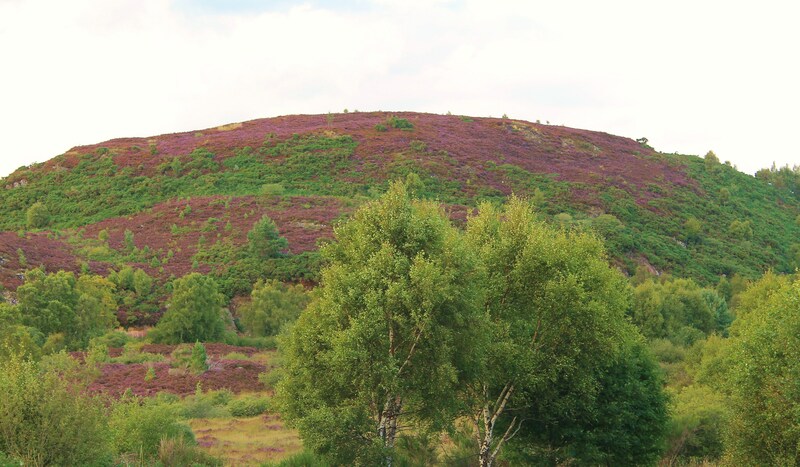 We drove up the A82 as far as Drumnadrochit (Druim na Drochaid, “ridge of the bridge”) and then drove west a little to take the A333 north through Beauly and Dingwall and then join the A9 north of Inverness as it finished crossing the Black Isle. (Dingwall comes from the Norse, Þingvöllr “meeting place”; it is also called Inbhir Pheofharain in Gàidhlig, meaning “the confluemce of the Pheofharain” referring to the nearby river.) We would see Dingwall again in a few days under the cover of darkness, but as we passed by on this day, it was bright and sunny. We were trying to make it to John O’Groats before sunset, but the way the day had unfolded did not allow for some of our planned stops and it kept us on the road until after dark. GPS is a wonderful thing, except when it isn’t. Out in the open moors of the Parish of Canisbay (Canaispidh, probably from a Pictish name) in the Northeastern corner of Caithness (Gallaibh, “among the strangers”) the roads are narrow and run in winding ways that connect several small hamlets. We were looking for the little hamlet of Upper Gills and our lodging for the night but the GPS kept us one road over to the east so that it kept saying that we had reached our destination. The destination it had us reaching was a completely dark road in between two completely open fields. We saw a bright light a half a mile or so away and so I drove off to find a road that would get us there. After a couple of wrong tries, we found our way and were very thankful to find that the bright light was indeed a beacon leading us to the Bencorragh House. 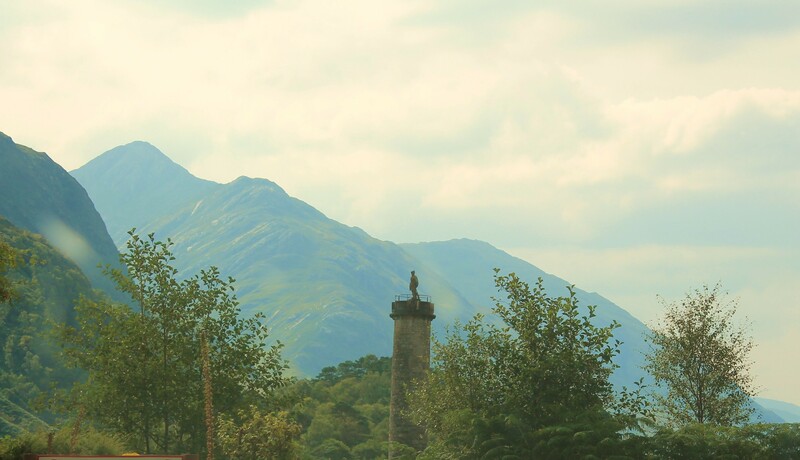 This entry was posted in Ancestry, Eco-travel, Scotland, Self drive Scotland tours and tagged Ben Nevis, Castle Stalker, Glengoyne, Great Glen, Loch Shiel, Oban. Bookmark the permalink.